Parent questions are a part of all daycares. Those questions begin with the first phone call. A parents job to find appropriate daycare for their child(ren) can be an enormous task. 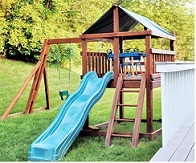 There are so many choices available (centers, nannies, home daycare, relatives), price ranges and types of environments. This means that many parents are doing their homework and really looking at what each type of daycare offers. I’ve compiled a list of common parent questions I have been asked during interviews over the years. The parent questions may range from only a few questions, or all the way to one parent I had that came armed with a four page questionnaire. Either way, you need to be prepared with answers. Are you licensed? If you are, great. If you are in the process of being licensed, be honest. Never lead a parent to believe you are licensed, if in fact, you are not. How long have you been a provider? Parents need a specific answer. If you are just starting out, say so. Do not assume parents are more likely to go with long-time providers. Some parents are looking for smaller groups for their child. This works out to the advantage of someone just starting out. Where is your daycare located? At this time I gave a more specific area. (i.e. on Wilson Drive, 1 block from the water tower). I only gave my exact address when arrangements were being made for an in-home interview. What are your hours of operation? My hours were 6am to 6pm. I stayed firm on this since I was open for 12 hours per day. If you have other hours but are willing to be flexible, say so. A word of caution however,... do not be too flexible or you may wind up working some very long days. How many children are you currently providing care for and what are their ages? Keep a list by your phone so you don’t have to think about this one. How much do you charge? I typically tried to stay away from answering this until the actual in-home interview (i.e. I charge typical going rates, based on the number of hours your child would be in care), but more and more parents would press the issue. Many parents will narrow their search for a provider based on fees. Many times, this will be the first question you are asked. So, my advice… give them the answer they are looking for. You’ll either fit in with what they want to pay or you won’t. If not, you won’t be wasting your time with an interview either. Do you have pets? Sometimes they are asking out of curiosity because their child is fond of animals, other times because of allergy issues. If you have pets and the parent does not ask in the telephone interview be sure to inform them anyway. You don’t want to move to an interview just to find out that their “little precious” can’t stop sneezing in your house. Are you a smoker? In Minnesota it is against regulations to smoke in a daycare home during daycare hours. That does not mean, however, that someone can’t smoke after hours. If you have a smoker in your home, you need to be upfront about it and inform parents right away. Do you have references? I always had at least three references. I would not, however, give out names and numbers without an in-home interview. The parent questions above are typically enough for the parents to figure out if you are a provider who fits into the basics of what they are looking for. The basics being… location, size of daycare and cost. If you do… at this time you would suggest setting up an in-home interview. What type of education do you have? You may not have a college degree, but have you complied with all licensing regulations? If you have taken any classes above the state requirements, let parents know. This is also a good time to inform parents that you have had first aid training and are CPR certified. Is your daycare structured or more free-flowing? 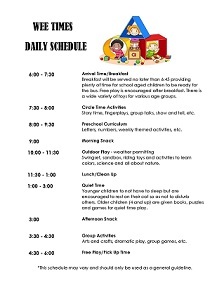 As you can see by my daycare daily schedule, my day was fairly structured. Everything happened at the same time every day, but all daycares are not the same. If you plan on having your daycare more free-flowing, let them know. All parents are not looking for a mini-preschool. First and foremost, they are looking for a safe environment that is nurturing. Do you offer regular outdoor play? On the whole, this is something most parents are looking for. You don’t have to spend most of the day out-of-doors, but parents do want their children out in fresh air using their large motor skills some of the time. Trust me, you want this too, since children need to run and play to release some of that energy they have. You should easily be able to answer the following parent questions if you have a well thought out and prepared policy handbook. What type of sick policy do you have? Do you offer a meals/snack program? Are children allowed to watch television? How will you communicate that my child has a behavioral problem? Will there be other adults around my child? Once you have given each item careful thought and created your own policy handbook, stick to it. Your handbook was created according to the way you want your own daycare to be. If that does not fit with what some parents are looking for, so be it. Your job will be much easier if you are caring for the children of parents who respect both you and your policies. This list is by no means complete. While they are the most common parent questions you will be asked, the parent interview questions are as varied as the parents themselves. Sometimes a parent question will surprise you. An example? I had a parent who said to me, “His old provider gave him a can of soda every day when he left, can you do that? I should state this child was three years old. I firmly said, “No”. It took two months before he stopped asking for soda on his way out the door. He was in my care for almost a year and on his last day I gave him a kid-sized serving of juice in a cartoon character sippy container. He was supremely happy with it.